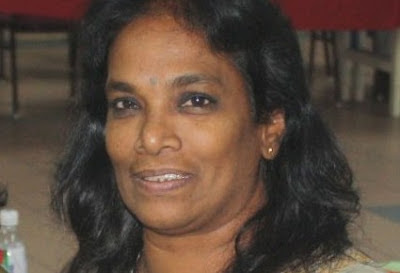 Former Malaysian YCW leader Ms Sarasvathy Muthu is one of six activists who have been detained under Malaysia’s harsh internal security laws. Sarasvathy and five other leaders of the Socialist Party of Malaysia are being held under the Emergency (Public Order and Crime Prevention) Ordinance on the grounds that they were the “main movers” of the pro-democracy rally on July 9, 2011, organized by Bersih (Coalition for Clean and Fair Elections). They had initially been criminally charged with “preparing to wage war against the king,” evidently based on their possession of T-shirts with portraits of dead or long retired Communist Party leaders. After they were released on July 2 on bail, they were immediately re-arrested under the Emergency Ordinance, Human Rights Watch says in a statement calling for their release. Known as the PSM 6 r the EO6 those arrested are: Michaeal Jeyakumar Devaraj, PSM member of parliament for Sungai Siput; Sukumaran Munisamy, PSM Central Committee member; Letchumanan Aseer Patham, PSM Sungai Siput branch secretary; Choo Chon Kai, PSM international coordinator; Sarasvathy Muthu, PSM national deputy chairwoman; and Sarat Babu Raman, PSM youth chairman. Lawyers for the detainees told Human Rights Watch that the “PSM 6” have been held in solitary confinement, subjected to continual and intense interrogations, and blindfolded both in detention and during transport to meet with legal counsel. Habeas corpus hearings, to determine the lawfulness of their detention, are scheduled for July 22 in Kuala Lumpur High Court, yet it is unclear whether the police will permit any of the detainees to attend. The police and the Attorney General’s Chambers are expected to argue that detention under the Emergency Ordinance is both justifiable and lawful. Malaysia’s Emergency Ordinance permits the police, on their own initiative, to hold anyone they deem a threat to public order for 60 days. The home minister may extend detention for two more years, renewable indefinitely in two-year increments. Twenty-one other PSM party members were released on bail on July 4 after being charged under the Societies Act with acting on behalf of an unlawful organization and under the Internal Security Act with being in possession of subversive documents. Available information indicates that the 21 are being prosecuted for engaging in their rights to freedom of expression, association, and assembly, Human Rights Watch said. Their release on RM8000 (US$2,670) bail appears grossly excessive in light of their alleged crimes. Parti Sosialis Malaysia is a legally registered political party and currently has one member in the national assembly. When it began its campaign on June 24, its agenda included promoting participation in Bersih’s July 9 march and educating Malaysians about issues the ruling government coalition were not addressing, such as combating government corruption, calling attention to growing income gaps, and raising concerns about increased ethnic tensions and deteriorating democratic institutions in the country. Human Rights Watch has repeatedly called on the Malaysian government to end the use of all preventive detention legislation, including the Emergency (Public Order and Prevention of Crime) Ordinance, the Internal Security Act, the Dangerous Drugs (Special Preventive Measures) Act 1985, and the Restricted Residency Act 1933. “It’s high time that Malaysia’s leaders recognize that democratic governance means engaging with the political opposition rather than throwing them in jail,” Robertson said. Sarasvathy Muthuhas joined the YCW during the 1980s where she organized textile and food industry workers in Jelapang and Tasek factory level and also the state level to form a union body involved in picketing and strike. From that time, she has travelled to various parts of SEA to represent Malaysia at conferences. Saras is actively involved in women’s groups networks such as AWAM and WDC in discussing the challenges of the female working community. As a full time activist in Parti Sosialis Malaysia (PSM), Saras contended in the 2008 elections for DUN Jelapang. Even though she lost, she served the constituency with a big heart, Malaysia Today says.